On 2-4 April in Bilbao, 300 exhibitors from 50 countries joint a top line-up of conference speakers in the conference, including Ministers from 5 different countries. The theme for the event was: Delivering a clean economy for all Europeans. The people who work in wind industry: are there enough of them, are the right skills out there, how can we best support what we hope will be a growing workforce? EERA JP Wind participate to the event, sharing his vision and contributing in shaping the vision for the future of wind energy. 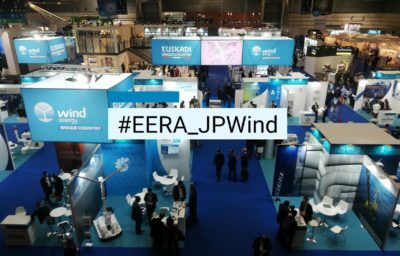 As Research Alliance JP Wind is focused on offshore wind energy R&I priorities, but also the prospective of the industry is important in order to better merge the efforts to reach common sustainable goals. Here you can find EERA JP Wind pictures.